I see it has been deleted from the forum. Does that mean ChampCar could do a race somewhere like say Area 27? 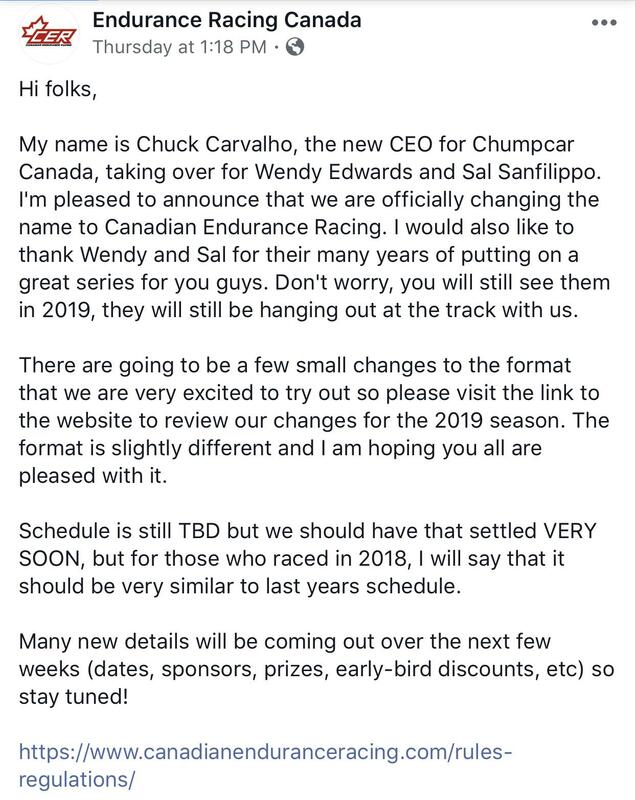 Alrighty then, looks to be discontinued from ChampCar. 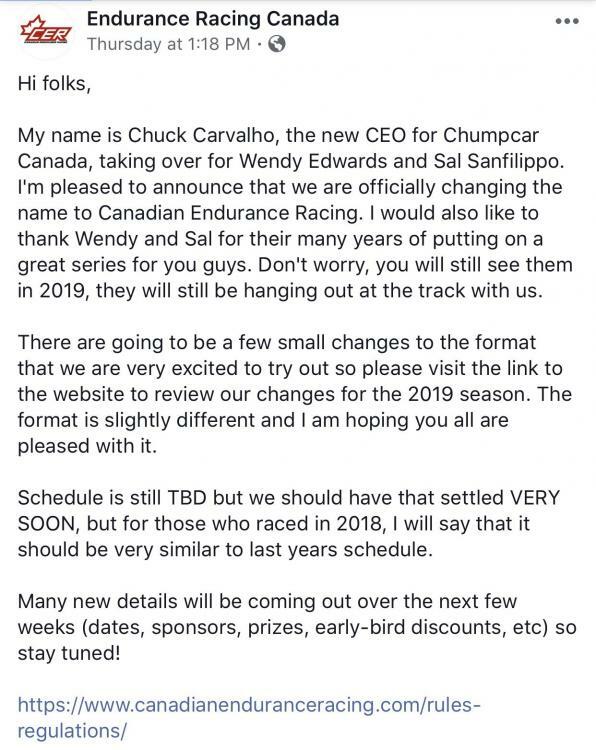 @Bill Strong how do us Canadians join ChampCar as previously we would join ChumpCar Canada and be transferred over to the US system? Its sad that CER is using a totally different format than Champcar. Our team does not want to go bracket racing based off qualifying. On the flip side we are excited to run more USA events. Just register yourself in the US system. I think that freebie is now gone. I'm really hoping rules stay close to par and you can travel without paying membeship twice. both sides lose if not. From what the rules say, no novices are allowed. As far as racing cars go, it appears that anything goes if it has a roll cage and all of the requisite safety equipment. Come one, come all, it would appear. Should be fun to have another option for racing in Canada and will allow anyone with any type of racing car to get it out and on a race track racing. That's a positive. The eligibility of a Driver to compete will be decided solely by the Series using whatever means it determines as appropriate. 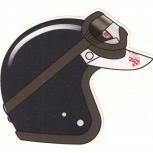 All drivers must hold a current, valid government issued Drivers Licence. Release and Acknowledgement Forms: All drivers and crew members must sign a track supplied and a CER release, waiver and acknowledgement agreement. Event Credentials: All drivers and crew (“crew” includes all non-driving attendees, including but not limited to, family, friends, invited guests and general spectators) are required to sign a waiver and receive a color-coded wrist-band, or other CER-approved, event-access credential. Often referred to as a “Pit Pass,” this credential may or may not allow access to pit lane. Track restrictions shall take precedence over CER general access allowances. When I went through tech with Sal last year he asked if I had everything as per ChampCar (maybe that was ChumpCar at the time) rules and within 500 points so in the west (I feel like I say that a lot) it has not been an arms race. Maybe (as per usual) in the east it is different. "Previously documented experience" sort of points to "no novices". Bullet point two reads that driver eligibility is contingent on previous documented competition experience in a sanctioned series. Yeah it does sort of read that way but it's not definitive either. It's what my old english teacher would call an "incomplete sentence", I have the D's to prove it. There's a certain draft feel to the document. Same thing as you have to have 4 drivers in the car for qualifying. Knowing Chuck I'm pretty sure it's not meant as exclusionary (I think chump/champ had something similar about "tell us your other experience"). "From what I herd" - So you never raced with us? If you think opening it up to every race car brings numbers youre sadly wrong. AER had 10 or 11 Cars at Bogie last year while Chumpcar had atleast 30. I raced twice with Canada this year, people definitely pushed the rules further than the US teams from what I saw and heard. Well I think there was a definite reluctance on most people's part to be "that guy" who files the protest. However some of the top CDN cars also do quite well in Champ apparently un-protested. There was a team 2 years ago that were over the top, as I recall they were given a 1 race "benefit of the doubt" then shown the door after their 2nd race. Our car was on the trailer early at both Mosport and Bogie races this year. I wish I could have been in the position to be "that guy" but we were already headed home by time any race finished. I have raced in Canada, multiple times. I'm not comparing anything to AER. Just going off of what peeps up there have told me first hand. My impression is, It's very much that no one wants to be "that guy". Perhaps a case of Canadians being too nice, which is usually a good thing. It seems like the new rules may address the current situation, my view from afar as an interested observer. Sal employed a very clever strategy: Saturday evening they put on a free BBQ with beer, protests delayed parc ferme and kept everybody away from the beer. Sal employed a very clever strategy: Saturday evenin﻿g they put on a free BBQ with beer, protests delayed parc ferme and kept ev﻿e﻿rybod﻿y a﻿﻿way﻿﻿﻿ from the beer. Beer>Trophy is what you are saying. FWIW, I didnt see too much in the way of rampant rules breaking. There wasn't ever much in the way of protests and I think there was a pretty laid back attitude to teching the car. But, with that being said, most of the winners over the recent times have been winners/podium cars in the US races too and no one has come down on them in those cases either (except for #balloonedgastankgate....). Then again, maybe they are referring to my car...?! Have you tried it? And does the race length for brackets change anything? Or is everyone still out there all together it's just official now that there are different classes? boo to bracket racing. I want to race the field (minus EC) heads up. that's the good stuff. Protests aren't happening because Race Monitor is never up until at least an hour into the race so you can't tell how many penalty laps anybody had. Also you have to ask to privately see a suspect car's Total Competition Value, then fill out a protest form. Nobody has the time for that. Bracket racing - however unpopular - fixes this and is beneficial to the new teams and "Chumpy" teams that have run low on real world dollars when go-fast parts become less restricted. We had great car counts this year and a lot of new teams. Build it how you want it and come race is working.